Christina Dalcher is obviously a talented writer, as you will see from the quotes that I will share later on. This is one of those books that you will not want to put down because the story flows so well and you will need to know what happens. Dalcher creates a word that is so claustrophobic that you as a reader physically feel it. There were characters that I thought were really dynamic and interesting, and characters I felt were flat. I thought it was interesting to be in the head of our main character, Jean, and seeing her navigate the situation she was in was definitely compelling. I also enjoy her colleagues! I wish we had a better understanding of her husband and her son. As much as I enjoyed Jean, I disagreed with some decisions she made that I won’t share because it would be a spoiler. I wish there was a moment where she had more conflicting feelings about what she was doing! The plot of this book is what intrigued me the most! The average woman speaks more than 20,000 words a day, and in this book they are only allowed 100 words. I felt so claustrophobic and frustrated just reading this book! I can not remember a time where the plot of a book made me so angry. I could not imagine what it would be like if I were every actually in that situation. This is one of those books that will make you extremely uncomfortable, and that is it’s purpose. It is very effective! I have mixed feelings about the ending! It seemed to wrap up too quickly and in a way that I felt was too neat and a little too far-fetched. 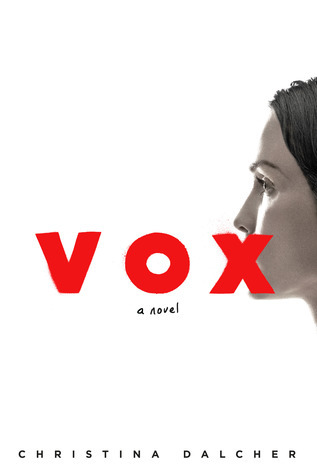 Vox is an interesting novel and I am glad that I read it. Just sitting here typing this review and thinking about the story is making my blood boil! I think that is a huge credit to Christina Dalcher’s writing. Even though there were things I would change about the ending, I still enjoyed the journey. This book is extremely political, so if that isn’t your thing than I would avoid this one. Vox is most definitely a book for people who enjoyed The Handmaid’s Tale. Thank you to Penguin Random House Canada for sending me a copy of Vox in exchange for an honest review. Ahoy there matey. I be glad ye enjoyed this one more than I did. It irked me. I did enjoy readin’ yer viewpoint though. Arrr! Oh I definitely understand why this book would not work for everyone! Thank you! It is really an intense read! Thank you! I’m looking forward to this one. I’m glad you enjoyed it. I hope you enjoy it! It is such a frustrating book but in a good way? Thank you! It is definitely relevant to what is going on in the world today. Maybe it even hits a little to close to home. Not a book I would recommend if you are looking for an escape that is for sure! Fantastic review! I loved this one, as well. Definitely not a soothing read, but a good one! Thank you! That is for sure! It is definitely an interesting book! Thank you! Thank you! Me either! Just the thought of it stresses me out! Thank you! I am curious to see what you think about it!! It is definitely intense! Great review! This book sounds so interesting!! I really “enjoyed” (can you say that about a book that makes you angry?) The Handmaid’s Tale, so maybe I’ll add this one to my TBR! Thank you! That is exactly how I felt about this book. I think you would “enjoy” this one as well! Just waiting for my copy to arrive at the library! Great review. I saw this book pop up on goodreads last week and had been wonde about it. Thank you! It’s an intense read but I definitely think it is worth looking in to! Thank you! It’s definitely worth the read!